FIGURE 1 Organization and internal structure of the spinal cord. Pairs of spinal nerves leave the vertebral column through spaces between the vertebra. These nerves are classified by the region of the body they innervate: cervical, thoracic, lumbar, or sacral. (A) Lateral and (B) dorsal views of the entire spinal cord. The spinal cord is shown in blue, and spinal neurons are in black. Note that the spinal cord is shorter than the vertebral column, leaving a space at the caudal end of the vertebral column that contains only spinal nerves. (C) Cross sections of the spinal cord at different levels. Note that the white matter fiber tracts (shown in white) increase in size from caudal to rostral levels. 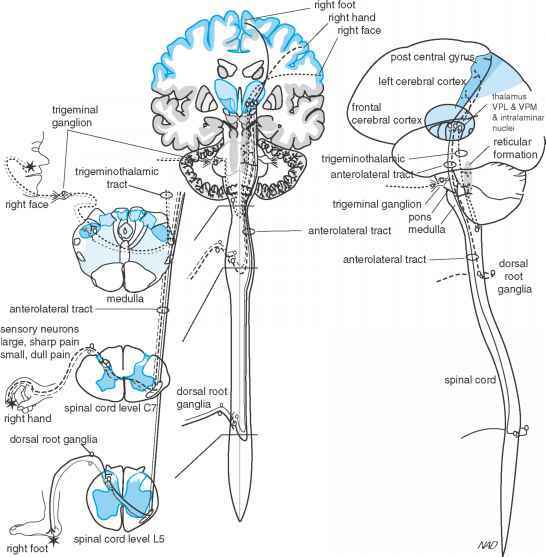 Also, the areas of gray matter, containing cell bodies and many synaptic connections (shown in blue), are larger in the cervical and lumbar regions because of the many motor and sensory fibers that innervate arms and legs respectively.